The stereotypical view of a start-up entrepreneur is an overworked, stressed-out, struggling business-person who is surviving just by the skin of their teeth. I’ve seen entrepreneurs discussing how many hundreds of hours they put into work over the last month, as if a higher number means greater achievement which means the greater the likelihood for success and high profits. As the author of Life Leverage, where my aim is to help you get more done in less time, this is not my philosophy at all. It may come as a surprise to you, but I do not believe that time and money are directly related, because of diminishing time and the diminishing law of return. It is far more important to work smart than it is to work hard, so I’m all about trying to find the most effective way to complete a task which involves the least pain for me. I would go so far as to suggest that pushing the idea of hustling and grinding for 14 hours a day is a dangerous myth. Let’s take a closer look. It’s an easy claim – “work harder than everyone else and you’ll succeed” – but I’m afraid that it isn’t the way that a small business works. Don’t worry – that should come as a relief. What if you have a family, and/or children? Do you truly want to abandon them for 14 hours every day, feed and wash yourself for 2 of them, and then sleep for the other 8? I would hope not. What about if you are beavering away at the wrong dam for those 14 hours, and therefore being busy for busy’s sake? It’s easy to focus your attention on the wrong areas of a small business, and without the right leadership qualities you are likely to make this mistake again and again. What about a year or 3 down the line, when all those hours of effort result in a premature burnout before you achieve that real, long-term momentum, which is the quality that a dedicated leader should always seek to build in their company? The suggestion of the hardest work resulting in the greatest return may be the case when conditioning for strength and stamina in sports, but in a small business it is better to invest time in short bursts of intense focus and dedicated, deep work over the long term. 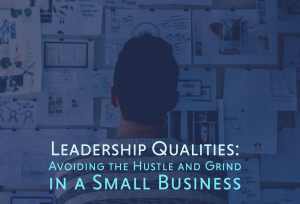 So, how does a successful entrepreneur employ effective leadership qualities and ensure that they are spending their time well, while reducing wasted time? It’s my belief that many, if not most, entrepreneurs only manage to spend about 20% of their time on the activities that have the greatest ROI. Much of the time they spend working, especially during the early months and years of a small business, is spent on basic operational tasks that rarely bring in the most profit. Here are my top four ways to avoid the hustle and the grind, and focus on the high-level activities that bring in the most money. In Progressive Property, Mark and I began building our team much later than we should have. Once our stress levels hit the highest point, we employed our mums to give us a hand. In many ways, employing reliable workers as soon as you can comfortably afford to pay them is a fast-track towards a healthier, more profitable company. Leverage the 80% of your tasks that are less profitable, and take care of the other 20% personally while reaping the greatest yields from them. Choose the right path to invest the most time in carefully. The most effective key for defining the right tasks to tackle and the right leadership qualities to employ is to define your strategy clearly before dedicating any time to it. To uncover an effective strategy, you must first define your vision and values. A business vision will often naturally spring from the recognition of the values you hold to be most important in your life. It is incredible how frequently entrepreneurs fail to recognise these key considerations before focusing their energy on a small business, so I would recommend expending time and energy on this before embarking on a new venture. Next off, an effective strategy requires you to recognise your company’s key result areas (KRAs), which are the task areas that make the maximum difference to your team and generally bring in the greatest yields. Be ruthless with your KRAs, checking throughout the year whether the functions you are performing each day are adding to this area of your business. If they are, keep them. If they are not, either delegate them, outsource them, or dump them entirely. There is no shame in admitting that your strengths lie elsewhere and leveraging the activities that you do not excel in. In fact, an essential leadership quality is recognising each team member’s strengths and weaknesses – and that includes you! Depending on the activity, you may even find that there are freelancers and contractors who barely cost you a fraction of your income, but who can skilfully perform those tasks to a level you could never achieve yourself. This piece is not meant to suggest that hard work is avoidable when you are running your own small business, particularly a start-up. While I recommend working smart and prioritising your most significant KRAs, I’m afraid that there will always be times that require huge effort and many hours being spent doing things that you would prefer not to do. However – and this is a big “however” – the best entrepreneurs are those with the greatest leadership qualities, who understand the importance of strategizing, and know when to build your team, when to outsource, when to leverage.